– Twenty five years after Canada's first woman lifted off into space, the nation has launched a new coin honoring astronaut Roberta Bondar's historic mission. 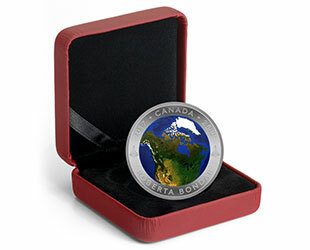 The Royal Canadian Mint's "View of Canada From Space" $25 coin features a photoluminescent illustration of North America that reveals city lights as they are seen from orbit when the coin is placed in the dark. 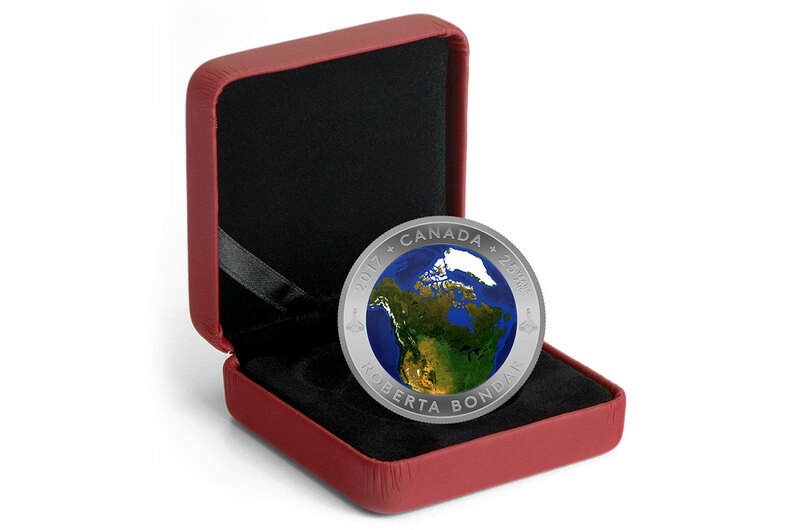 The commemorative is the world's first curved and glow-in-the-dark silver coin. 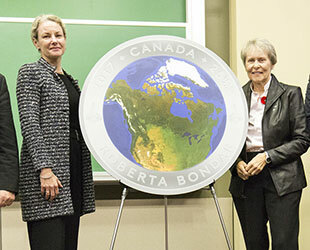 "The Mint is proud to celebrate the 25th anniversary of Dr. Bondar's historic mission with a coin as innovative as what she achieved for women and all of Canada," said Sandra Hanington, the president and CEO of the Royal Canadian Mint. "This new silver coin captures yet another story of a Canadian reaching for the stars and accomplishing things that will inspire us for generations to come." Bondar, who was also the world's first neurologist to fly in space, launched as a payload specialist aboard the space shuttle Discovery on its STS-42 mission. For eight days in January 1992, Bondar and her six U.S. and German crew mates worked in a Spacelab module to study the effects of weightlessness on living organisms and materials as part of the International Microgravity Laboratory-1. 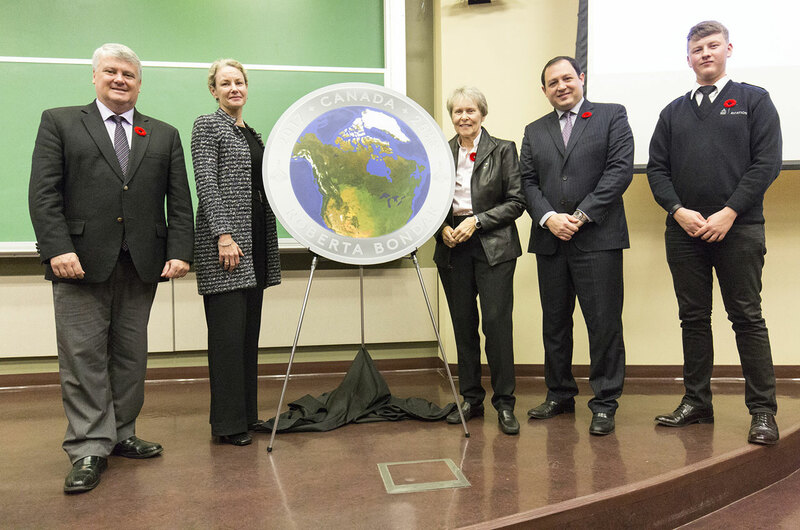 "We need to celebrate our milestones and pioneers as we push the frontiers of discovery," said Bondar, who attended the coin's unveiling at Sault College in Sault Ste. Marie, Ontario on Tuesday (Nov. 1). "Glowing in the dark, the coin represents inspiration and hope for the future and it is an honor to have my role in human spaceflight recognized in this meaningful way." "My view from [aboard space shuttle] Discovery 25 years ago forever changed my view of Earth and instilled in me a commitment to protect this magnificent planet. This special coin symbolizes the beauty of Earth from space," she said. As designed by Canadian artist Alexandra Lefort, the outer band framing the coin's central design features Bondar's name and text highlighting the anniversary of her mission, as well as a miniature depiction of space shuttle Discovery as it appeared on the STS-42 mission patch. "As the first Canadian woman to fly in space, Dr. Bondar will always be remembered as a pioneer among Canada's modern-day explorers," stated Terry Sheehan, member of Parliament for Sault Ste. Marie, Ontario. "The government of Canada is pleased that her achievement of 25 years ago and ongoing dedication to science have been honored by the Royal Canadian Mint." "Dr. Bondar has done so much to make her hometown of Sault Ste. Marie and the rest of Canada proud," Christian Provenzano, Mayor of Sault Ste. Marie, stated. "My fellow citizens and I are delighted that the Royal Canadian Mint has honored Dr. Bondar's remarkable achievements with this impressive silver coin." The 2017 "View of Canada from Space" $25 coin is limited to a mintage of 8,500 and retails for $159.95 CDN (about $120 U.S.). It is available from the Royal Canadian Mint, through its online store, as well as in the Mint's boutiques in Ottawa, Winnipeg and Vancouver, or from authorized dealers, including participating Canada Post outlets. The new coin is the latest to honor Canada's astronauts. The Royal Canadian Mint previously issued coins in 2006 that featured a holographic portrait of Chris Hadfield, the first Canadian astronaut to walk in space. Eight years later in 2014, the Mint released a coin featuring an astronaut in its design to celebrate the Canadian Space Agency's 25th anniversary. Canada's $5 bill also features the illustration of a Canadian astronaut on a spacewalk, as well as the Canadarm2 and Dextre robotic arms.